A reporter who covered a half-dozen Trump rallies asked a Trump supporter why he hated CNN, George Soros, Hillary Clinton, Maxine Waters, Corey Booker, “Pocahontas” Elizabeth Warren, blacks, Mexicans, gays, and others. The man retorted: “They want to turn America into a socialist country. It’s disgusting.” In addition, the man said he would shoot his own sister, who is a Democrat, if she ended up being on the wrong side in a civil war. He said he would have no problem shooting her in the face. That’s when I started to think the Brownshirts of Hitler have risen from their hells, that the white supremacists who dropped the Zyklon B gases into the “shower room” where naked Jews, gays, and physically and mentally handicapped were killed 400 at a time at Auschwitz and other death camps. Have the Brownshirts and the SS units migrated in caravans to America? Or are they homegrown Trump cult “nationalists”? I wonder how many of the domestic white supremacists who marched at Charlottesville shouting “Jews will not replace us!” “White lives matter!” and “Blood and soil,” the old cry of the Nazi SS, have read William L Shirer’s epic book “The Rise and Fall of the Third Reich.” It’s a 1,250-page book published in 1960, and is an overwhelming indictment of Hitler, the Nazis, and the whole idea of white supremacy. It has to be the greatest single book ever written about how Germany went off the rails in the 1930’s. It took Shirer about 15 years to write it, and he asks this most important question: Why did Germany, one of the most civilized, forward-looking, and highly educated societies in the world, blessed with great art, literature, and philosophy, transform itself into a gulag of death and labor camps across Europe? Why was it trying to create the “Reich” of a thousand years? After a half century his book is still the best book ever written about what caused the Holocaust. In the same year Shirer’s epic was published, one of his top administrators, Adolf Eichmann, was captured by Israelis after hiding in Argentina for 15 years. Eichmann was the commander and organizer of the trains running from all over Europe carrying six million Jews, gays, and handicapped to the gas chambers and ovens in the death camp gulag. According to one of his assistants, Eichmann, the chief of the Jewish office of the Gestapo, told him shortly before Germany surrendered that “he would leap laughing in his grave because the feeling that he had five million people on his conscience would be for him a source of extraordinary satisfaction.” Evidently he would have laughed harder if he had known the Final Solution total was six million. I wonder if he would have also killed a sister by shooting her in the face. This “biography” of Noah Klieger was published in the November 2018 issue of HARPER’S MAGAZINE. 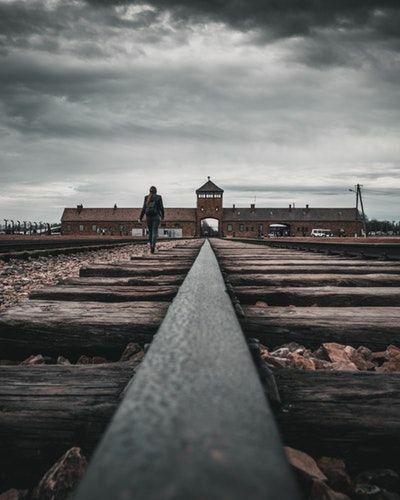 It is the most concise history of death camps I have ever read, and it is based on the personal experiences of Noah who rode one of Eichmann’s trains to Auschwitz in January of 1943 when he was seventeen. Each train car carries 80 men, women, and children. It is a two-day 800-mile trip. Each car has one bucket of water and one bucket for waste to use during the 50-hour trip. When they reach the death camp all prisoners are selected for just two lines so they could be examined by German SS doctors. One line is for men and boys 16 and over. The other is for women, children, and men over forty. Most of the women and children and men over forty are deemed unfit for labor. About 80% of any train load is sentenced to death on the spot. But they are not told. They are taken to barracks, given a bar of soap, and told to undress for hot showers. Then 400 men, women, and children sentenced to die are taken to a huge room with many shower heads on the walls. Huge “BATHING AREA” signs are on the walls. Then air-tight doors are closed and the killing gas called Zyklon B is poured into the room through the shower heads. It takes about 15 minutes to kill 400 people. After the room is ventilated for 30 minutes, Jewish prisoners promised life called Sonderkommando enter the room and carry the dead—after removing any gold teeth—to the ovens of the crematoria where the bodies are burned. The Sola River, which runs along the camp, is turned gray by the human ashes shoveled into it by the sonderkommando. The ovens have to operate seven days a week and 24 hours a day in an attempt to keep up at Auschwitz with the dead. The sweet smell of burning bodies corrodes the countryside. Noah survives the lines and is selected to perform slave labor for I.G. Farben, a German chemical company. But first with 200 other men he is taken to a roofless hanger of sorts and told to undress. The temperature is about 20 degrees below zero. For a full day and night the men stay in the hanger. Noah and some men survive the ordeal by exercising the entire time. By dawn half of the men have frozen to death. He has spent just two days in Auschwitz. In the morning after this ordeal Noah is lined up with 300 other prisoners where they are asked by an SS officer, “Who can box?” Noah, who has never boxed a round in his life, decides to volunteer. It probably saves his life. The boxing coach decides to keep him. He loses 32 boxing matches in a row but the real boxers let him get in a couple of good blows so they keep him alive. But every night he gets an extra liter of soup so he is able to fight. He also gets to practice boxing for three hours every week. He is assigned slave labor and carries 100-lb cement sacks and mixes it in iron molds from six in the morning to six at night. The prisoners get 15 minutes for lunch. If a prisoner drops a cement sack he is immediately shot. Miraculously Noah Klieger survives two years at Auschwitz and Ravensbruck death camps and is rescued by the Russians. He weighs eighty-eight pounds. In 1947 Noah lands in Haifa, Israel aboard the legendary ship Exodus, gets a job at a Hebrew newspaper where he has worked for over seventy years. He is now the oldest active newspaper editor in the world. He has covered several Olympics and has given many speeches around the world about his life at Auschwitz. He has covered trials involving the German concentration, labor, and death camps. He has gone back to Auschwitz exactly 164 times for Holocaust Remembrance Days. Only one out of ten prisoners survived Auschwitz and the labor camps. Jews represent 2% of our population today, or about 500,000 more than were murdered by Hitler during the Final Solution. Yet 60% of all religious crimes in the United States are committed against them. Melissa Fay Greene has written about these crimes for many years. When she wrote a book about the 1958 bombing of the Hebrew Benevolent Congregation in Atlanta, she used the sentence, “When the wolves of hate are loosed on one people, then no one is safe.” Although no one was injured, 50 sticks of dynamite blew the synagogue to pieces. Four other synagogues in the area were bombed within a year. Melissa used the line again in writing about the massacre of 11 elderly Jews at the Tree of Life Synagogue in Pittsburg. I’m assuming she is aware that the wolf has been used as a symbol in Germany for over 500 years. Peasants used it as a symbol of liberty and independence. But wolves and wolf traps (wolfsangel) were extensively used as symbols by German SS armored and infantry divisions during WWII, including Waffen SS Division Das Reich units that murdered hundreds of thousands of Jews and others throughout Europe.